Helping U.S. firms succeed in China! Helping Chinese companies succeed in the U.S.! Caravel was established in 1993 with the mission of promoting global trade. Caravel offers a broad range of products designed to help firms conduct business in the global marketplace. Caravel's goal is to establish itself as the leading information company in US-China trade as well as a popular brand name in global commerce. Partial list of Paid subscribers to "American Business in China"
3M; ABB; Allied Signal; American Brands; American Export Register; American Express; Antec; Arthur Andersen; AT&T; Baker & McKenzie; Banc One; BP America; Brunswick Corp; Bax Global; Chubb & Son; Cincinnati Milacron; Columbus McKinnon; Deacons Graham & James; Deloitte & Touche; Discovery Communications; Eaton Corp.; Eastern Chemical; Federal Express; Fluor Corp.; Ford Motor; General Motors; Halliburton; Hormel Foods; Hyundai America; Ingram Micro; Koch Industries; Kohler Co.; Lens Crafters; Marriott Int'l; McCormick & Co; McKinsey & Co; Merrill Lynch; Mitsubishi Int'l; NEC; News Corp.; Nippon Express; Panduit Corp.; Qualcomm Corp.; Reynolds Int'l; Ross Engineering; Russell & Co; Sanwa Bank; Schenker Int'l; Scherwin-Williams; Shangri-La Hotel; Sullivan & Cromwell; Torrington Co; Tupperware; United Technologies; Western Atlas; William Kent Int'l; Xerox; Young & Rubicam; etc. AGSIM Thunderbird; American State Univ; Columbia Univ; Indiana Univ; John Hopkins Univ; Massachusetts Institute of Technology (MIT); Memphis State Univ; Monterey Institute of Int'l Studies; Moorhead State Univ; Portland State Univ; Princeton Univ; Rutgers Univ; Stanford Univ; Syracuse Univ; U.C. Berkeley; U.C. San Diego; Univ of Hawaii; Univ of Iowa; Univ of Maryland; Univ of Minnesota; Univ of Michigan; Univ of Pittsburgh; Univ of Southern California; Univ of Texas; Univ of Vermont; Univ of Washington; The Wharton School; etc. Brooklyn Public Library; El Segundo Library; King County Public Library; Multnomah County Library; New York Public Library; San Francisco Public Library; South Pasadena Public Library; Torrance Public Library; etc. American Asociation of Advertising Agencies; ASTD; China External Trade Development Council; Department of Trade and Industry, United Kingdom; Hong Kong Economic & Trade Office; Hong Kong Trade Development Council; U.S.-China Business Council; U.S.-China Chamber of Commerce; U.S.-China Policy Foundation; U.S. Department of Defense, Voice of America; etc. Partial List of Paid Subscribers to "Chinese Business in America"
Amax; Americell; American International Group (AIG); Bensa; Carvon Packaging; China Television Ventures; China United Trading; Columbia Consulting; Daresco; Grocery Products; Ingram Micro; KPMG Peat Marwick; U.S. Trust Company of New York; Western Int'l Media; etc. Banc One; Bank of Canton; Bank of China; Bank of East Asia; Bank of Taiwan; Bank of the West; Cathay Bank; Chang Hwa Commercial Bank; Chinatrust Bank USA; Citibank; Far East National Bank; Guaranty Bank; Hongkong Bank; Ka Wah Bank; Nanyang Commercial Bank; Preferred Bank; Taipei Bank; The Chinese American Bank; Union Bank of California; United Overseas Bank; United World Chinese Bank; Wells Fargo HSBC Trade Bank; etc. Air China; BARTHCO; BAX Global; Cathay Pacific Airways; China Interocean Transport; Cho Yang Line; Columbia Shipping; COSCO; DANZAS; Dart Express; DNT Customs Services; Dynasty Forwarding; Hyundai America Shipping; IFB-LAS Freight; Interconex; J.H. World Express; Lynden Air Freight; Mitsui-Soko; Nippon Express; OOCL; Perfect Express; Schenker Int'l; Shipco; Streamline Shippers; Yang Ming Line; Zen Continental; etc. Brooklyn Public Library; Columbia Univ; Florida Trade Data Center; Heritage Foundation; John Hopkins Univ; Indiana Univ; Massachusetts Institute of Technology (MIT); Portland State Univ; Rose Institute; Stanford Univ; U.C. Berkeley; U.C. San Diego; etc. 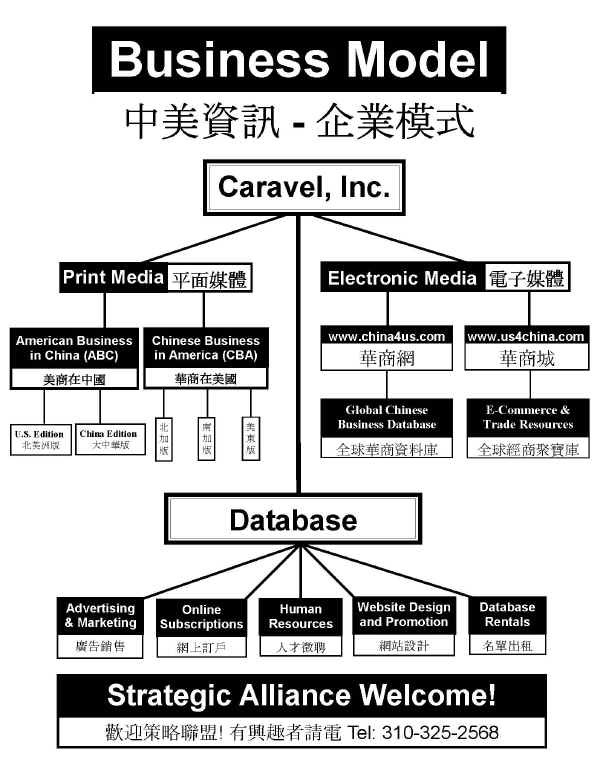 Caravel, Inc. - The #1 Think Tank in U.S.-China Trade & Relations.